Crete, the largest of the Greek islands and the fifth biggest island in the Mediterranean, lies 318 kilometers south of Athens' port, Piraeus. Rimmed by more than 1,000 kilometers of coastline, it combines dramatic mountains with deep rocky gorges and blissful golden sand beaches. The most southerly outpost of Europe, its south coast extends to the Libyan Sea, looking to Africa, while cultural influences from Asia Minor can also be felt from the period spent under Turkish rule. Thanks to its fertile soils and warm, sunny climate, the local economy is based on agriculture, with tourism coming in a strong second. Crete's ancient archaeological sites, centuries-old harbor towns, and beaches attract visitors from all over the world. Contained within the Samaria National Park, this impressive 18-kilometer gorge is on the UNESCO World Heritage Site's tentative list. 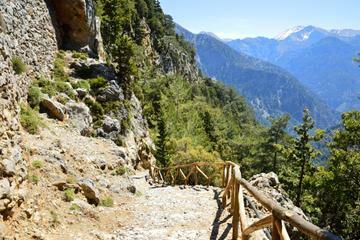 From Xylóskalo, just outside the mountain village of Omalos, the gorge descends 1,250 meters to arrive at the Libyan Sea in Agia Roumeli on Crete's sunny south coast. The river Tarraios, which dries up in summer but floods in winter, runs the length of the gorge with high rocky cliffs to each side. The stony path is quite challenging and not recommended for people with knee problems, but it's a must-do for athletic visitors to Crete. On the busiest days, up to 3,000 people hike through the gorge. The walk can take four to six hours depending on how fit you are. It is open to visitors from May through mid-October. A pre-Greek Bronze Age culture and the first maritime power in the Mediterranean, the Minoans were named after the legendary King Minos. Knossos, near Heraklion, is believed to have been the palace of King Minos. This monumental residential complex centers on a vast courtyard, where it seems they staged "Bull-Leaping," an activity that involved running towards a bull, grabbing it by the horns, and somersaulting over it. 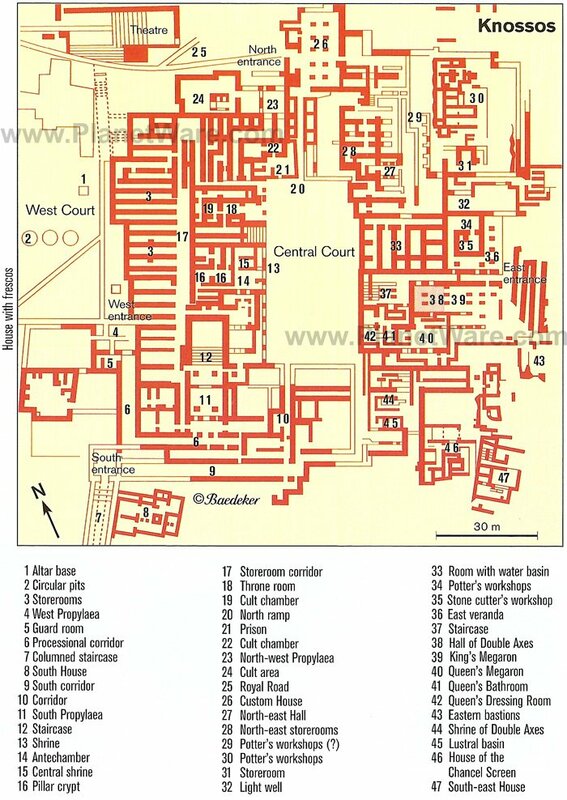 Knossos was abandoned around 1450 BC. Archaeologists are not sure why - it may have been a catastrophic earthquake following the volcanic explosion on Santorini, or perhaps Crete was ravaged by invaders. Whatever the cause, the Minoans completely disappeared. 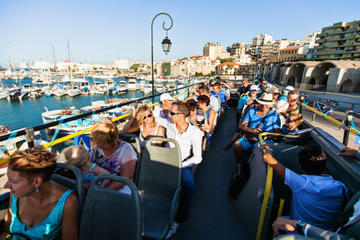 Heraklion (Iraklion) is the island's capital and the obvious base for visiting Knossos and exploring central Crete. Like many of Crete's finest coastal towns, it gained its present layout under the Venetians, who ruled from 1204 to 1669, a period which saw a considerable cultural flowering on the island, producing artists such as El Greco, from Fódele, near Heraklion. The noted 20th-century writer, Nikos Kazantzakis (author of Zorba the Greek, 1946) was also from Heraklion, and you can see his tomb within the old town walls. Heraklion has an airport (five kilometers east of town); is served by regular ferries from Athens' port, Piraeus; and is a popular port of call for cruise ships sailing the Eastern Mediterranean. The temporary exhibition here at the Heraklion Archaeological Museum is magnificent, and when the new museum (currently under renovation, completion date uncertain) finally opens, with 23 halls, it will be truly world-class. On show are finds from archaeological sites across the island, including prehistoric, Bronze Age, Roman, and Hellenic treasures. The pride of place goes to the Minoans, with their enchanting frescoes depicting proud and slender young men and women in vivid shades of terracotta-red, ochre yellow, and cobalt blue. Chania (Hania, Khania) is the main town in Western Crete, and was the capital of the island until 1971 when it moved to Heraklion. Overlooking the Aegean Sea and backed by the White Mountains, which are snow-capped in winter, the old town's appearance dates from the centuries spent under Venice (1204-1645). Chania is a lovely place to explore on foot. A warren of romantic alleys with pastel-colored buildings enclosed within the remains of 16th-century defensive walls, the town extends to a pretty fishing harbor. The agora (covered market), built in 1911, is worth a look for its fresh seasonal produce and gifts such as Cretan cheese and honey. Chania has an airport (12 kilometers northeast of town on Akrotíri peninsula) and is served by regular ferries from Athens' port, Piraeus. It makes a fine base for visiting the beaches of Elafonissi and Balos, and hiking the Samaria Gorge. Midway between Chania and Heraklion, Rethymnon's lovely old town is made up largely of Venetian-era buildings, though there is some evidence of the year spent under Turkish rule (1669-1898) such as the towering minaret. Many historic buildings have been turned into small boutique hotels, shops, and tavernas, and the long, narrow, sandy beach east of the old town makes it easy to combine cultural sightseeing with a few hours of swimming and sunbathing. The mountains behind Rethymnon are home to rural villages and some excellent agritourism centers. The area makes a good base for visiting nearby attractions such as the Samaria Gorge and Mount Psiloritis. Along the north coast of eastern Crete, about 65 kilometers east of Heraklion, Áyios Nikólaos (Agios Nikolaos) is home to Crete's most popular modern resorts. Rimmed by beautiful beaches, it sits on the slopes above Mirabello Bay near the posh beach hotels and villas of Elounda. Highlights of a visit here include a stroll along Lake Voulismeni, with its many waterfront cafés and restaurants, and a boat trip to Spinalonga Island, the location of the Greek TV series spawned from the book The Island by Victoria Hislop. Near Áyios Nikólao, you can also visit the Diktean Cave with its stalactites and stalagmites or venture into the mountains to the the charming village of Kritsa where local artisans sell traditional crafts such as leather goods, ceramics, and hand-woven rugs. On the way to Kritsa, stop by the little 13th-century church of Panagia Kera (Our Lady of Kera) to admire the superb Byzantine frescoes. On Crete's isolated east coast, the lovely golden sands of Palm beach (Finikodasos) are backed by a dense grove of towering palm trees. According to local legend, the palms grew from date stones washed ashore from Saracen ships in the ninth century. Whatever their origin, the palms certainly flourish in Crete's balmy Mediterranean climate, with relatively mild and wet winters and completely dry summers of subtropical heat. The beach is lined with blue sun beds and straw umbrellas, and tourists will find a café and basic water sports facilities here. To the south end of the beach, a rocky outcrop with a viewing platform affords fine views down onto the shore and is ideal for taking photos. The nearest sizeable resort is Áyios Nikólaos 96 kilometers away on the north coast.